Zaragamba is the name of the original Hobbit family from the Eastfarthing. They are heredity Thains of the Shire. They passed it the office to the Took clan and removed the strip of land between the Baranduin and the Old Forest. It has been translated from the Red book as Oldbuck. Zirik-Zigil is the dwarvish name for the centermost of the three great peaks of Moria. It is known to man as the Silvertine and to Elves as Celebdil. 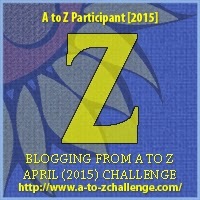 Nice end to our A-to-Z challenge! Wow! I can’t believe you found words in Tolkien for z.
Congrats on finishing and will look forward to more posts! Well done. A pleasure to read through all your hard work on the A to Z Road trip!